In cloud environments, where a lot of VMware Platform Services Controllers (PSC), vCenter Servers and Solutions are used, it can be tough to see how everything is connected. When we try to upgrade such an infrastructure, it can be even more difficult, as compatibility issues can arise when the infrastructure upgrade is in progress with different components having different versions. 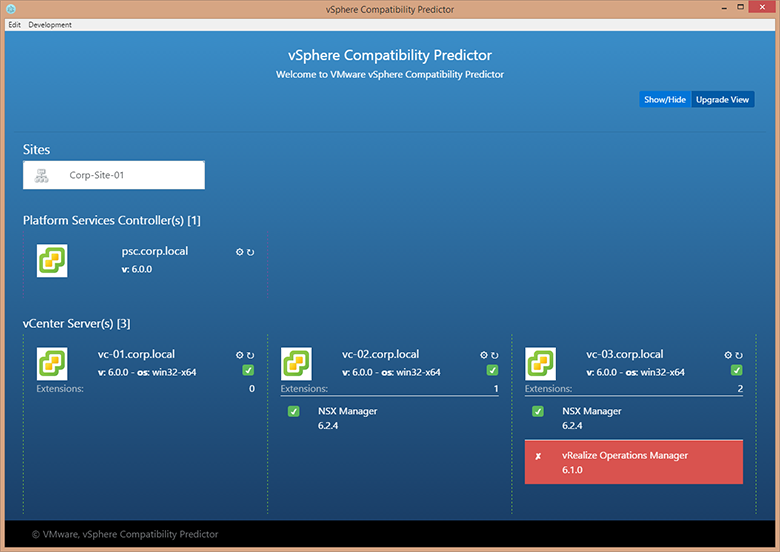 When you choose the Upgrade View in the Fling, it will show which Solutions are compatible with vCenter Server 6.5. This can help the administrator plan the upgrade in advance. This Fling is for the VC upgrade, and can only detect VC solutions. The SDDC Discovery Tool is used to focus on the SDDC product suite level while this Fling is more for the VC upgrade. Click on "Upgrade View" button on the right top corner of the application to see the upgrade compatibility.